U.S. Sen. John Cornyn has filed legislation to expedite a U.S. Army Corps of Engineers study that will determine how best to protect the Houston region from a devastating hurricane. Editor's note: This story has been updated throughout and a clarification is appended. U.S. Sen. John Cornyn filed legislation Wednesday that he says would expedite the long process of constructing a hurricane protection system for the Texas coast, including the particularly vulnerable Houston region. But while local officials cheered the high-profile support, it’s unclear how much the measure would actually speed anything up. Most agree on the need to build a project known as the “coastal spine” — a massive floodgate and barrier system — to protect the Houston region from a devastating hurricane that could kill thousands and cripple the national economy. The U.S. Army Corps of Engineers has estimated that construction on any such system for Texas couldn’t begin until 2024 at the earliest. Cornyn’s bill is intended to hurry things along by requiring the Corps to take local studies into account and by eliminating the need for Congress to authorize construction of whatever project the Corps recommends. The Corps has already said it would consider locally done studies, however. And while getting rid of the need for Congressional authorization could shave off a small amount of time, the real hurdle will be getting Congress to help fund what is sure to be a multi-billion-dollar project. "The devil's in the details, right?” said Bob Mitchell, president of the Bay Area Houston Economic Partnership. “But I will tell you that for the senator to step up and start this process is very positive, and it can't do anything but help ... the positive is Senator Cornyn has done something, and we've got to build on it." In March, the Tribune and ProPublica published an extensive look at what Houston’s perfect storm would look like (a companion story ran on the Reveal radio show and podcast.) Many scientists, local leaders and public officials expressed frustration that Texas’ Congressional delegation has not done more to protect against such a storm. Mitchell said it was important that the Senate’s second-highest-ranking member was taking a public interest in the issue. He added that even though the Corps was already planning on considering the hurricane protection study from the Gulf Coast Community Protection and Recovery District, which was formed by six Houston-area county judges in the wake of Hurricane Ike, it’s important that Congress would now require them to do so. 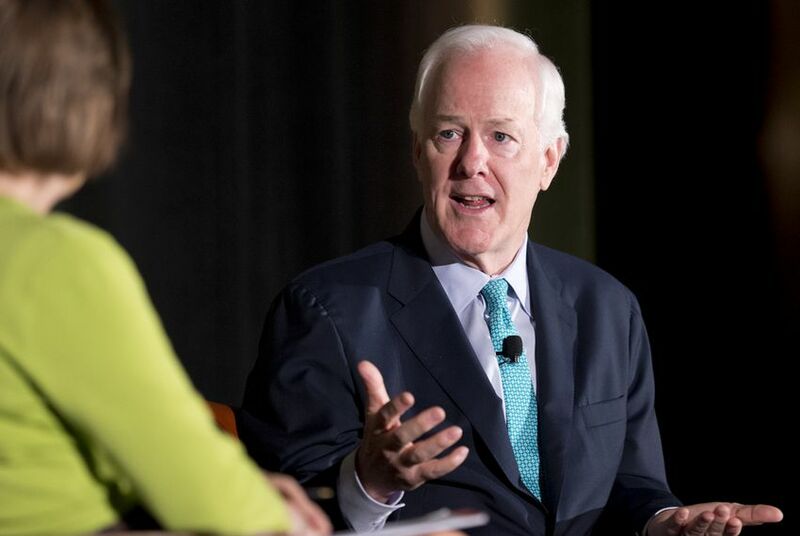 Cornyn was not available for an interview Thursday. An aide in his office who agreed to speak about the bill on background said it would ensure the Corps doesn’t duplicate efforts and would save time, which Mitchell agreed with. “Texans along our coast live under the constant threat of weather-related devastation to their homes, their livelihoods, and their communities,” Cornyn said in a statement Thursday announcing the legislation, dubbed the “Corps’ Obligation to Assist in Safeguarding Texas” or COAST Act. Texas Land Commissioner George P. Bush praised Cornyn’s legislation in a statement Thursday, saying it “is vital to expediting implementation of recommended coastal protection projects." Bush had pushed for the Corps to begin its $20 million study earlier this year, insisting that the General Land Office provide half the cost. It’s up to Congress to provide the additional $10 million. Cornyn’s announcement comes days after crippling floods hit the Houston region. His office made no mention of the legislation earlier this month, before those floods, when The Texas Tribune asked what Cornyn was doing to address the Houston region’s extreme vulnerability to hurricane storm surge. An Army Corps spokeswoman did not immediately respond to a request for comment on how the legislation would help the agency’s cause. Clarification: This story originally stated that it was unclear how Sen. Cornyn's bill would speed up the process. It now clarifies that it is unclear how much the measure might speed up the process. Houston is the fourth-largest city in the country. It's home to the nation's largest refining and petrochemical complex, where billions of gallons of oil and dangerous chemicals are stored. And it's a sitting duck for the next big hurricane. See how the next big hurricane could devastate the Houston region.